Anastazia is a friend of mine, one of those uniquely wonderful people San Francisco attracts. When I showed her the web site for my project she was excited and wanted to create a photo for her husband, Fkir. She told me to come over that weekend and we would do it. “Very good,” I replied. “Send me an email, we’ll refine the idea back and forth, and plan out what we will create.” It turns out this is not how Anastazia operates! She explained that she is very in the moment, and trusts the process. Planning is anathema to her; she doesn’t do it. Now if this was anyone else I might insist on planning even a little. But knowing Staz, as her friends call her, I figured this would work and I just might learn something about spontaneity along the way. I arrived at her studio ready to shoot and she told me that one of the things she loves about Fkir is that he holds the space for her to be messy, to scream, to have tantrums, to destroy things, to just get whatever is eating her inside out. When she is done, he comes over and holds her, kisses her, and they move on. I find this extraordinarily beautiful. Their understanding allows Staz to be more fully herself, more human, more authentic to what is really happening for her. What a gift for one human to give to another! 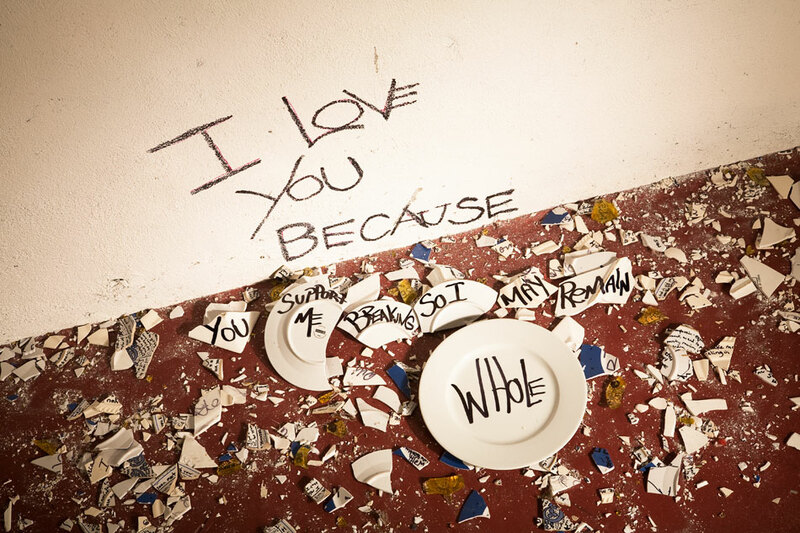 She wanted to illustrate this appreciation by smashing plates against a wall and writing on the shards. As we talked about the idea she wanted to execute, we realized it would be best to invite more people over. This would be a community plate smashing event! Staz wanted many friends to write something they wanted to let go of on a plate and then throw it against a concrete wall. So we put out the call and that night, at midnight sharp, nine people assembled, ready to destroy plates. Some were saying good-bye to old relationships, some to negative patterns of thinking, some were simply smashing a plate for fun. Staz wrote I Love You Because low on the wall as our target. On the count of three we all threw them and the explosive noise was tremendous. Some plates got obliterated. Others simply broke into a few pieces which Staz picked out and completed her sentence on. I am of the firm opinion that it doesn’t get any better than this: secular ritual, creating art and coming together as community all rolled up into one. The words I wrote on my own plate were “Self-doubt.” I have come to realize I no longer need it. I trust my experience and I trust this journey. Thank you Anastazia and Fkir.